A road over bridge (ROB) has been collapsed in Mumbai's Andheri today's morning at around 7:30 am. 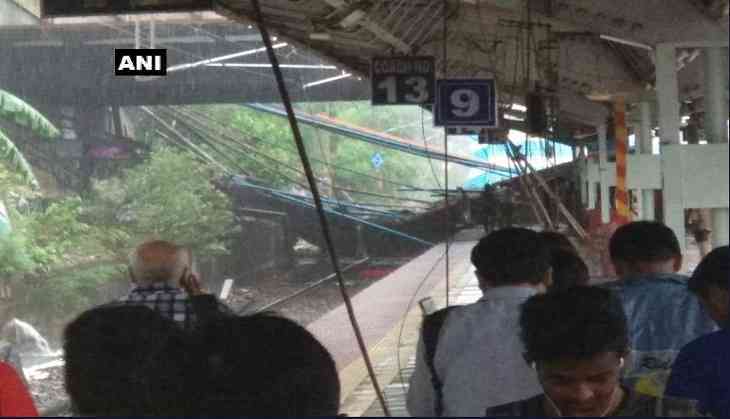 The part of the bridge has connected the Andheri West and Andheri East, collapsed due to the heavy rain in the city for last night, say reports. Due to the bridge collapse, the trains on the Western line have been affected. Two people are injured, said Police. According to the Mumbai Police, they are checking whether if some people are trapped under the debris or not? BMC, fire brigade, Railway Police Force staff have all been rushed to the spot. Overhead wires were also affected, said officials. Police have also stopped all traffic above and below the bridge. However, four fire brigade vehicles have been rushed to the location, ANI reports. The Gokhale bridge connects Andheri East and Andheri West stations and is used by thousands of commuters each day. A National Disaster Response Force(NDRF) has reached to the spot. While the meteorological department has predicted heavy rain in the next 48 hours. However, it has been raining heavily in Mumbai since last night and various parts of the city are waterlogged.